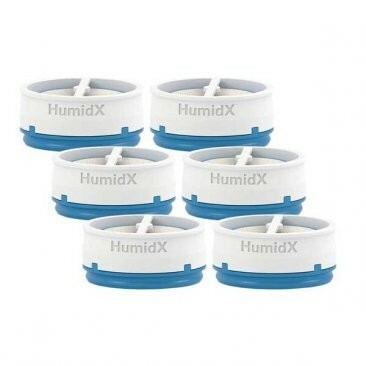 The Standard HumidX™ for AirMini™ Travel CPAP Machine (6 Pack) is a package of 6 HumidX™ waterless humidification units for use with the AirMini™ Travel CPAP Machine from ResMed. This is a three pack of the standard HumidX™ units and does not include any other items. Ships TODAY if you order within the next 8 hours and 16 minutes. The standard HumidX™ is for use in normal or humid climates where only a normal amount of moisture needs to be added to therapy air. 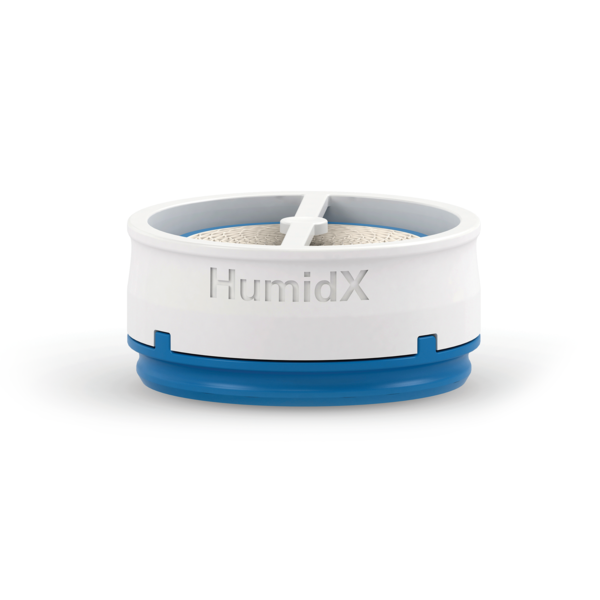 For dry climates where a larger amount of moisture is needed, the HumidX™ Plus is recommended. The HumidX units are not compatible with any other masks, hoses, or machines. The HumidX 6 Pack is only compatible with the AirFit™ N20 and P10 setup packs for the AirMini™ Travel CPAP. They are not compatible with any other machines, masks, or hoses. Assembly: To assemble the HumidX™ device, gently pull apart the bulbous connection point on the CPAP tube. With the blue base pointed downward, secure the unit on the end of the connection. Then, connect the short tube pieces together and lock into place. Disassembly: To disassemble the HumidX™ device, twist and disconnect the bulbous connection on the hose. Remove the HumidX™ after 30 days and replace with a fresh unit. Check daily for signs of damage or blockage. Replace the unit 30 days after the HumidX™ package is opened. DO NOT wash the HumidX™. There are no customer reviews at this time.